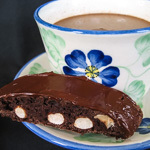 Day 2 of our Gourmet cookie extravaganza thing, and for today’s cookie I chose benne wafers from 1954. 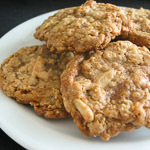 These have a short list of ingredients and are very easy to make, and though those are not the primary reasons I chose this cookie, it certainly made the decision easy. I happen to really enjoy benne wafers and now my boys do, too. I haven’t made them in years, so this was a fun way to introduce them to my family. Benne, or sesame seeds, were brought to America by African slaves, and the plant is common in the South. Olde Colony Bakers in Charleston, SC claims to have the only existing original recipe for benne wafers, and they sell plenty of them. I haven’t had the opportunity to taste some, but I’m going to check them out the next time I’m in Charleston. In the meantime, this recipe will do quite nicely. The first batch didn’t come out so well. Instead of benne wafers I had benne puddles and amoebas that ran together and stuck to the parchment, a sure sign they weren’t cooked thoroughly. The second batch worked better because I slightly cut back on the amount of dough for each, spaced them further apart, and left them in the oven 4 extra minutes (my oven tends to run a little cool). 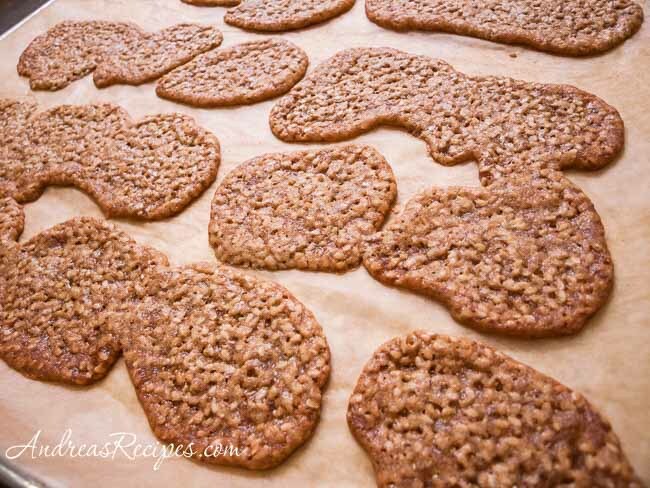 Under those conditions, the cookies came out perfectly brown and slipped right off the parchment. 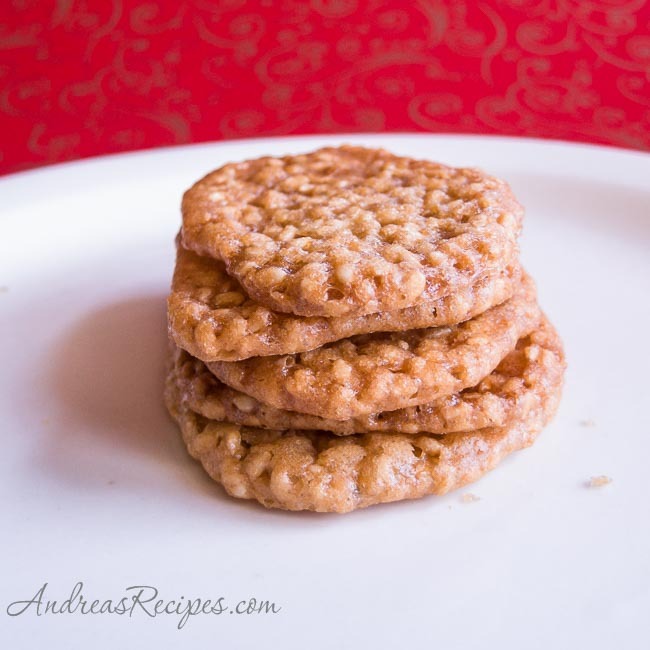 They taste appropriately sweet and nutty and have a perfect snap. I will definitely make these again, though with the mentioned modifications to avoid the Amoeba Syndrome. I have one tip for acquiring ingredients. Buying sesame seeds in small spice jars at the grocery store will become expensive quickly, so check other places where you can buy in bulk, such as warehouse clubs, coops, or Asian grocery stores. Adapted from Gourmet magazine, 1954. In the bowl of the stand mixer, mix together the butter and brown sugar until the mixture is light with no lumps. Add the beaten egg, flour, salt, vanilla extract, and sesame seeds. Mix until all the ingredients are combined and the seeds are well distributed. If the mixture looks runny, sprinkle on a little more flour. Drop the dough by the teaspoonful onto the prepared baking sheet. Dip the bottom of the glass into the ice water and press down on each ball of dough. Bake in the preheated oven for 6 minutes or longer (mine took considerably longer). The cookies should be a dark golden brown and slip right off the pan. If they are stuck, pop the baking sheet back into the oven for a few more minutes. 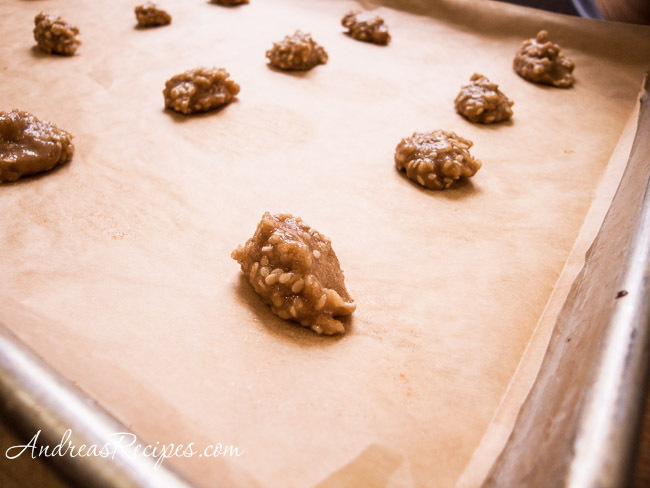 Rest baked cookies on the sheet pan for a couple minutes, then transfer to a wire rack. 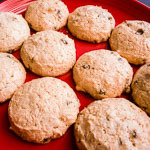 Cool completely and store in a tin away from other cookies (to keep them crispy) for up to 2 weeks. Ha I did them today. My first attempt was like yours. I noticed other recipes used more flour. They are wonderful. These caught my eye, too, and yours look tasty! Haha! You and Courtney both had amoeba issues. I think I like them. Sort of like bread art for a party. I wasn’t going to make these, but I have some black sesame seeds that would be cool. Courtney, it’s so funny that we were making the same cookies. Kellypea, I didn’t think about black sesame seeds, but I’ve got some in my pantry. That would be good and look very striking. Emily, the amount of butter is correct as listed on the Gourmet recipe. Now all that sugar is another thing, but we really liked them as is. oh is the egg necessary in this recipe ? I am vegetarian and do not eat eggs. Hi Kiran. I did not test these without eggs, but I’m sure you could substitute with applesauce or an egg replacer such as Ener-G egg replacer should work.